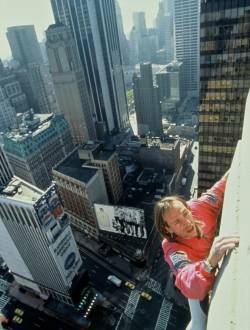 As a child, Alain Robert was determined to become a top climber. When he was just 12, he climbed eight floors to get into the family apartment because he had forgotten his keys. Alain trained on the unforgiving cliffs of southern France, climbing solo. This meant climbing with his bare hands, with no ropes for protection. In 1982 he fell 15 metres, head first. He suffered a five-day coma and multiple fractures: to his cranium, nose, wrists, elbows, pelvis and heels. The prognosis was that he would never climb again. But this didn’t stop him. In 1993, he set a world record for the most extreme solo ascent, in the Gorge of the Verdon. The time was ripe for new challenges. In 1994, Alain climbed his very first skyscraper, in Chicago – and the ‘Real Spiderman’ was born. He realised that he enjoyed conquering the impossible, and so he began travelling the world searching for the skyscraper of his dreams. He has been to jail many times, for climbing without permission. But still he carries on. To him, a city is like a range of mountains, with one important difference: there will always be new skyscrapers under construction.